Millions of Americans paused during the Monday after Thanksgiving to check out online deals and check off people on their holiday gift list. But so-called Cyber Monday may be in danger of losing its online sales title. The Monday after Thanksgiving is traditionally the busiest online shopping day of the year, but stores are releasing internet deals earlier, stretching them through the week, as well as making them available in stores. Shoppers looking for discounts spurred online sales on Black Friday to a new high. During the holiday shopping weekend that kicks off on Thanksgiving and the day afterward known as Black Friday, more and more shoppers decide to skip the mayhem in stores and buy online. Cyber Monday still packs the biggest punch in terms of a single online shopping day—for now. Shoppers spent $540 million between midnight and 10 a.m. Eastern time on Monday, affirming that sales are expected to total $3.36 billion, up 9.4 percent from a year ago, according to an early tally by Adobe Digital Insights, which tracks online retail transactions. But other days are catching up. Adobe's forecast puts Cyber Monday neck-and-neck with Black Friday, when consumers spent $3.34 billion, a 21.6 percent jump from last year. Retailers rolled out more sales on Monday: Amazon offered $40 off the normally $180 Echo smart speaker and 60 percent off a KitchenAid stand mixer, at $220 down from $550. Walmart offered $100 off a regularly priced $300 Power Wheels Disney Frozen Jeep Wrangler motorized toy car. And Target offered an extra 15 percent on Sunday and Monday—both online and in stores. It offered a deal on a Samsung 43 inch flat panel TV for $200 off its regular price of $600, plus a $50 giftcard with purchase. "The deals are better today than Friday, for sure," said Michelle Chernicoff in Largo, Florida, who picked up an Eye Brush Set half off its regular price of $25 at Ulta.com for a gift for her sister. But she said she shops online throughout the holiday season for the convenience more than the one-day-only deals. "I'm looking for at least 30 percent off on higher end items I'm purchasing for my family," she said. "I have a huge family; shopping the deals between Black Friday and Cyber Monday give me the opportunity to buy better quality items while keeping a budget." Online sales have also been stretching out more and more. 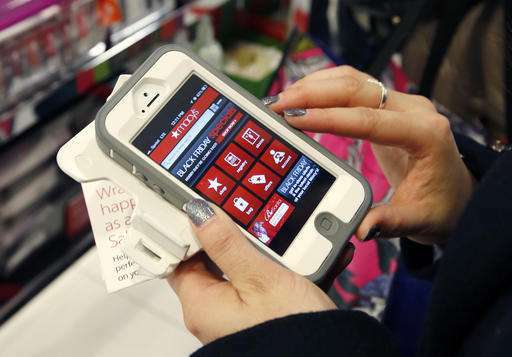 Cartwheel, Target's digital app, started offering holiday deals including 50 percent off one toy per day on Nov. 1. Amazon started offering 35 days of Black Friday deals on Nov. 16. And Walmart kicked off its Cyber Monday deals at 12:01 a.m. EST Friday for the first time as it aimed to grab customers ahead of its competitors. Madison Agnello took advantage of the early online sales, picking up a 43-inch LG 4K Smart TV at half of its original $600 price tag the week before Cyber Monday. "I'm shopping soon rather than later, to get it over with and not having to worry about things being sold out," Agnello said. But she still hopped online Monday to check out the deals. She required at least 20 percent off and free shipping to buy. She picked up a pair of Adidas on Adidas.com, for $30 off the original price of $120 and free shipping. "One more gift then I'm done Christmas shopping!," she said. Cyber Monday, which is the Monday after Thanksgiving, has been the busiest day of the year for online shopping since 2010. The phrase was coined in 2005 to encourage online buying when people returned to offices where they had high-speed internet connections. The term is still used to promote heavy discounts online, even though most people now have constant access to the web via their phones and computers. ComScore expects mobile sales to make up 20 percent of online sales for the first time this year, and Adobe said mobile purchases surged 33 percent on Black Friday to $1.2 billion. Promotions have changed in response to buying patterns. Instead of door-buster markdowns on a select few products, retailers are shifting to a stream of discounts and alerts during the entire week via email and social media. "It's really this weeklong flow of deals," said Shawn DuBravac, chief economist at the Consumer Technology Association. Research firm comScore had predicted online spending on Cyber Monday will jump to $3.5 billion from $3.12 billion last year. The firm's preliminary holiday shopping forecast, which includes November and December, is for online sales to rise as much as 19 percent to $81 billion. Overall, the National Retail Federation trade group is forecasting holiday sales for the November and December period to rise 3.6 percent to $655.8 billion, better than the 3 percent growth seen in the year-ago period.